Another cold morning, minus 3 around dawn. Light NE turning NNV around 10. Nets open 06-12, netmeter hours approx. 1600. The 3 nets in the NE corner of the trapping area was put up late morning, and one other worn/bleached net was replaced with a new net. Ringed: Wood Pigeon 1 (first this season), European Robin 3, Song Thrush 5, Common Blackbird 14, Common Starling 3, House Sparrow 1, Chaffinch 1, Yellowhammer 1. Total = 29. Also 22 controls, including a Yellowhammer ringed as 2cy in March 2012. 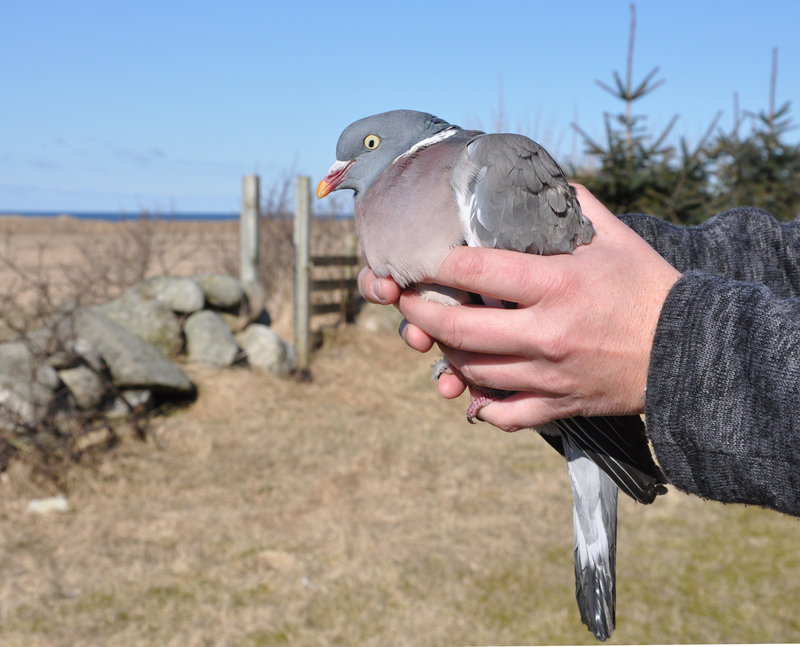 The first Wood Pigeon of the season was ringed today. Ringdue. Observations: Short-eared Owl 1 by the Gocart range, Song Thrush 15.